Luxury like no other. Private lake-view whirl pool, palmy communal pool. Perfectly situated between the Beaches, Airports, & Murcia City. Close to everything & away from it all your next holiday home is a perfect oasis with a private hot tub for starlit dips, a nearby pool whenever you want it, or a beautiful tranquil lakeside mountain view when you just want to escape from everything. Whatever your enjoyment, this property really has it all. Casa Paramount (Paramount Villa) is named in part after the resemblance of the unbroken mountain view seen from the paramount location of the penthouse Jacuzzi. This charming three-story terraced Townhouse comfortably sleeps 6 adults & greets you with a fully furnished & large open-plan contemporary living room & dining area, 2 bedrooms (1 double, 1 twin), 2 bathrooms (1 en-suite), ample double sofa-bed, a well-equipped kitchen, and more. 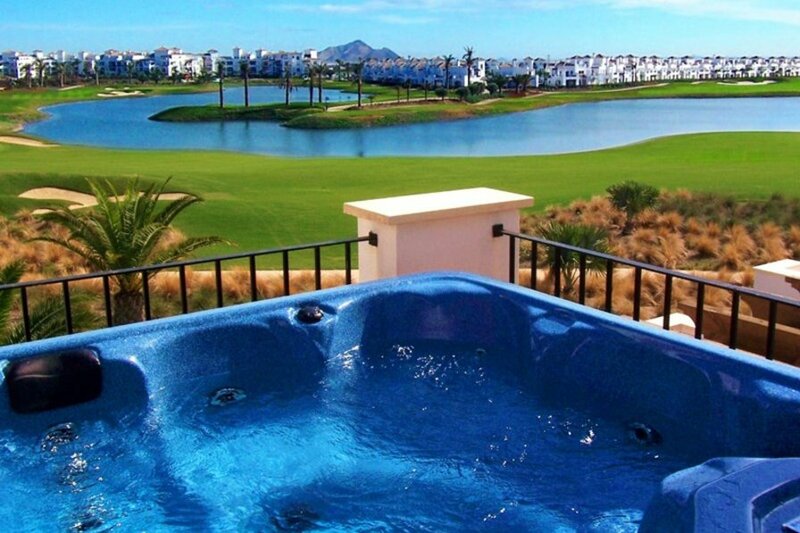 The house is situated on La Torre Resort - a highly prestigious, gated community development with 24 hour security. Ideally located in the Murcia region of Spain affording up to 250km of stunning coastline with sandy ‘Blue Flag’ beaches, 320 days of sunshine a year, up to 35-degrees in summer, with traditional fishing villages and historic cities. La Torre Resort offers its guests a grand entrance, lined with palm trees, water features and seating areas. Throughout the resort water features abound with lush planting and tropical trees giving the resort a true Mediterranean holiday feel. The resort is situated near the peaceful, traditional Spanish towns of Roldan, Balsicas, & Torre Pacheco for great local restaurants in the Murcia region, & is hardly 15 mins from historic & vibrant Murcia city. For transport it is very close to the San Javier motorway (C-3319) & 15 mins from Murcias San Javier airport boasting low cost flights from many countries. You will also be barely 15 mins from a number of beaches on the Costa Calida coastline, many of which have been awarded the Q mark for quality, and feature gorgeous sand & deserted dunes that go on for miles. At the heart of La Torre is a spectacular waterside village arranged around a second wonderful lake, putting the property a very short distance from the main resort town centre and its on-site supermarket, bank, travel agent, and more. It is a uniquely designed real town where you can find a whole world of services. You can forget packing an umbrella as this secluded world-class resort enjoys 300 sunny days per year, an average temperature of between 20 & 22 degrees C (reaching over 30C in the Summer) & it doesnt stop at the resort, with two different seas in the same coastline to explore. The region of Murcia is one of Spain's sunniest, most unspoilt, & most fertile. It is also blessed with some truly amazing scenery. As well as the beaches there are citrus groves & rice paddies, dramatic mountains & river valleys. The clear waters & clean sands have earned El Levante (named in honour of the rising sun that bathes the region day after day) more Blue Flag awards than anywhere else in Europe. And if you enjoy sailing, scuba diving, swimming, cycling, horse riding, walking, or even skiing you'll also be well catered for. You can even pack up and drive just a few hours North to the Sierra Nevada Ski Resort! For shoppers, the Murcia regions famous pottery, baskets & footwear make perfect traditional souvenirs, or you can visit the modern shopping centres such as Eroski in San Javier. Or after relaxing on your own rooftop solarium, or in the pool, enjoy the lively atmosphere of one of the local Tapas bars or the exciting nightlife on La Manga strip - the outer part of the naturally warm Mar Menor sea lagoon. The next day you can contrast all that with the relaxing tranquillity of the house, the mountains, or the nature reserves & lush countryside. For a family day on the beach, the Mar Menor (Valencia's Little Sea) is Europe's largest saltwater lagoon. Being quite shallow, this delightful lagoon is around 5 degrees C warmer than the rest of the Mediterranean & offers an especially suitable attraction for children. Alternatively the resort provides scheduled tours to the nearby islands and many other attractions. Nowhere else can you find such a diversity of historical, artistic, & gastronomic tradition within a setting of stunning natural beauty & ideal climate. Whether you are sampling Murcia's fine gastronomy, playing the many sports, visiting the cultural heritage, or simply enjoying its nature & wonderful towns, Murcia offers unlimited possibilities, & all within easy reach of this luxurious home away from home. *The whirl pool advertised is the property's luxury 4-6 seater hot tub. There is also a palm-lined communal pool just 120 seconds walk away.